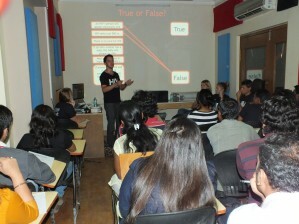 On April 26th Wake Up Pune volunteers held a bootcamp at Seamless Education Institute on HIV/AIDS. We addressed the most important aspects of the virus such as how it affects our immune system, how it is transmitted, what the treatment is and what can be done to avoid being infected. We also went through some world and local statistics on the virus spread. In addition, we discussed the discrimination and stigma towards people who are HIV positive. We talked about ways to stop such attitudes and to improve HIV+ people’s life. Seamless Education staff and students were highly participative. We had a nice time with them and thank them for their hospitality.